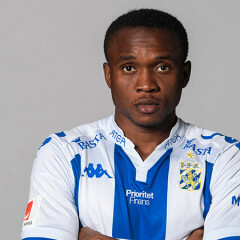 Lawson Sabah is a Ghanaian professional footballer who plays for Varbergs BoIS, on loan from IFK Göteborg, as a central midfielder. Sabah joined Inter Allies as a teenager. He played several games in the GhanaPremier League between 2014 and 2015 where he grew from a youngster to a regular figure in the team. In January 2015, he signed a long term contract with IFK Göteborg, but joined the Swedish side the following summer due to being under-age at the time. He made is senior appearance for IFK on 19 August 2015, playing 90 minutes in their 6–1 victory against Kristianstad FF in the domestic cup. His Allsvenskan debut came the following season, coming on as a substitute away against Östersunds FK in May. In July, 2017 the energetic midfielder joined Varbergs BoIS on loan.